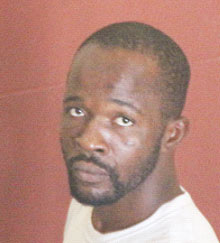 Handyman Quincy Henry, called ‘Fix It,’ who admitted to attempted murder, was yesterday handed a 13-year sentence by Justice Brassington Reynolds at the High Court in Georgetown. Henry pleaded guilty last month to the attempted to murder of Troy Hughes Bacchus, called ‘Fletcher’ on September 20th, 2015. His sentencing was deferred for a probation report, which was presented yesterday. Presenting the facts of the case, State Prosecutor Tiffini Lyken said Bacchus was at the Merriman Mall, where someone asked him for $200 and he gave it. The defendant, the prosecutor added, saw this and asked Bacchus for $100 but the man informed him that he did not have any money to give him. Bacchus, according to the facts, walked away and the defendant grabbed him and stabbed him to his neck. Before his sentencing, Henry offered the court a different version of the events. According to him, he was gambling at Bourda Market, in the vicinity of the greens area, while the complainant was having a conversation with his friends about 15 feet away. He noted that he was summoned by someone, who pointed to Bacchus and stated that Bacchus indicated that he wanted to cuff him (Henry) in the mouth. Henry stated that he told the individual, “That man can’t cuff me in my mouth because somebody done shoot he already and he don’t know is who.” Having said this, Henry noted that he then returned to his gaming. While playing, he stated that Bacchus went to him with a hammer and he then stood to face him. Bacchus, he said, asked him what he just said. Henry told the captivated court that his response to Bacchus was, “I dun seh wah I seh,” which caused Bacchus to raise the hammer to hit him. He said he fended off the blow and took out a knife that was in his possession, which caused the complainant to run. Henry stated, however, that Bacchus subsequently returned with a 2×4 and attempted to lash him, which caused him to put up his hand in defence, resulting in injuries to his skin. Henry went on to state that Bacchus fired a second lash, which caused him to grab the wood and fire a stab to keep his assailant at bay. He added that Bacchus was so aggressive and continued to advance, resulting in him (Bacchus) being stabbed to the left side of his neck. He stated that Bacchus fell to the ground and someone told him to “beat out,” which he did. Meanwhile, according to the probation report, Henry was described by other persons at Bourda market as a bully and a nuisance, but prison authorities described him as someone who rarely spoke and who sticks to himself. Justice Reynolds subsequently applauded the accused for his use of grammar and syntax, while noting that it is better than most with a substantive educational background. He stated that accused seemed to be a victim of his own circumstances, while highlighting the fact that Henry’s abuse of drugs, his speech impediment and the fact that he has difficulty hearing led to frustration. Justice Reynolds then began his sentence at 20 years and eventually deducted a total of seven. The defendant heard that if he behaved during his incarceration, he would benefit from remission.